If you are passionate about playing music, you’ve probably toyed with the idea of forming your own band. Most musicians dream of performing in front of hundreds of people with like-minded individuals. Though it sounds like a simple process, creating and maintaining a musical group can be quite a challenge. If you are serious about forming a band, this guide can help you get started. The first step to forming a band is to find other musicians to play with. The goal is to find like-minded people who specialize in playing other instruments that you aren’t the best at playing. Basically, if you already know how to play the drums you probably don’t need to find a new drummer for your group. If you have friends who are passionate about music you should ask them if they are interested in joining your band. You can also use several websites to find local musicians online. If a local music event is taking place soon, try attending one of them to look for some fresh talent. Once you’ve found band members, it’s time to decide what kind of music you want to play. Some bands can play different genres, but when you are just starting out it’s better to focus on one at a time so you don’t spread yourself too thin. If there is a particular genre of music you and your band members are passionate about, try sticking to that. This is important if you want to play professionally. Being part of a band is a big commitment, and it’s important to determine some ground rules so everyone knows what they can and cannot do. Legal issues can be arise, so draft some rules so everyone knows who owns what in regards to equipment and songs. Use this time to decide when the band should meet, because the group can quickly fall apart if just one member frequently misses practice. Even if you plan to play for fun, you should still do this so you can be respectful to each of your fellow band members. Another important aspect of playing in a band is determining where and when you and the other members should practice. You can choose a personal location, but if you have the money you might want to rent a place nearby. To make it easy, pick a location that everyone can travel to in a short amount of time. Also, you are going to get loud as you practice, so try to find a place where you won’t bother anyone; you don’t want to find yourself with a noise complaint. Once you’ve selected a practice location you need to practice as often as you can. Spend as much time as you can with your band members so you can learn how to effectively work together during a live performance. Once your group has enough experience, it’s time to start writing your own songs. Sure, you can practice by playing songs everyone already knows, but your group won’t gain recognition unless you create your own songs. 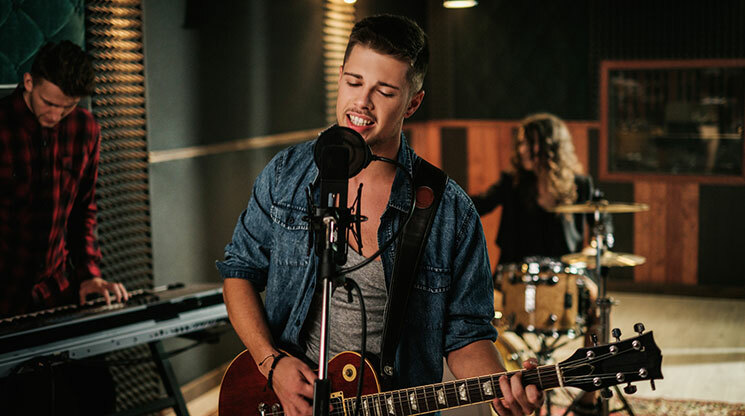 Assign the task of writing lyrics to the group’s vocalist, and make sure each member contributes to a song’s melody so every instrument is in unison. Most bands break into the music scene as the opening act for a more popular group, and it’s wise to have at least 4 or 5 songs to play in this situation. There’s plenty more to do after this, but these tips should help your band get off on the right note.